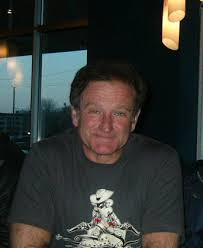 Fairy Tale Fandom: On Robin Williams. Sad, isn't it? Did you know he did a lot of ad lobbing on the Genie and they re-did the animation to fit? I have noticed that the funniest clowns are rarely happy people. They say that a lot of comedy stems from pain. Also, there's the old chestnut that comedy is "tragedy plus time".